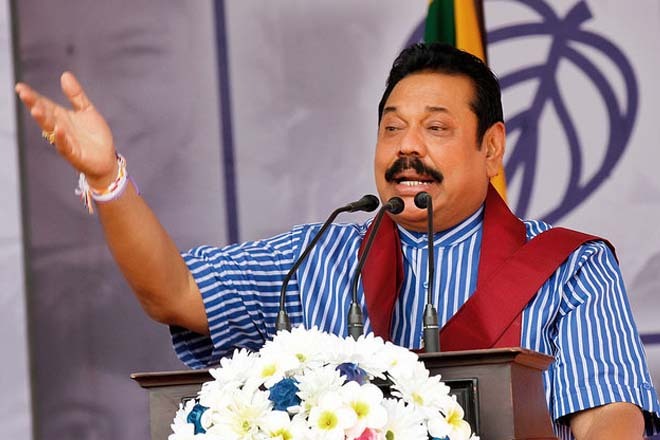 Feb 03, 2016 (LBO) – Former President Mahinda Rajapaksa releasing a statement for National Independence Day says he will not deviate from reasserting national independence even if his entire family including him gets imprisoned. “It is not surprising that such agents of foreign powers would see some symbolic value in jailing members of a government that won the war against terrorism before Independence Day,” he said. Commenting on the recent arrests Rajapaksa says they have been arrested under an omnibus provision in the Criminal Procedure Code enabling the police to arrest individuals to conduct investigations. Full text is reproduced below. On 4 February 2016, we celebrate 68 years of independence. Back in 1948 after having waited 450 years to be masters of our own destiny, Sri Lanka became independent under the government of Rt. Hon. D.S.Senanyake of which my father too was a member. By that time we had been used for the purposes of Western powers at their will for four and a half centuries. In 1972 we discarded the final symbolic links with the colonial powers and became a republic under a new constitution. However, from the early 1970s onwards we were subject to a different kind of restriction of freedom due to the rise of separatist terrorism which was supported by various foreign powers. In May 2009, we overcame the scourge of separatist terrorism through immense sacrifices made by our war heroes. However due to the actions of certain conspiratorial forces, even this respite was short-lived. Since 8 January 2015, we are once again being used by foreign powers for their purposes. The separatists who could not achieve their aims after nearly four decades of terrorism, now hope to achieve their aim with the help of these foreign powers. Since last year there has been an unending procession of foreign dignitaries visiting their latest ‘conquest’. Due to the influence of these foreign powers, dangerous LTTE detainees have been released and members of the armed forces have been arrested under the Prevention of Terrorism Act. Furthermore, plans are afoot to prosecute our war heroes for war crimes. What all this teaches us is that having achieved independence, you have to constantly exercise vigilance in protecting it. It was reported in the press that the leaders of several foreign funded NGOs had met leaders of the present government and insisted on the arrest of members of my government on corruption charges before the 4th of February this year. It is not surprising that such agents of foreign powers would see some symbolic value in jailing members of a government that won the war against terrorism before Independence Day. My son Yoshitha, my Press Secretary Rohan Welivita, Nishantha Ranatunga and two directors of the CSN TV Channel Ravinath Fernando and Kavishan Dissanayake have been arrested under an omnibus provision in the Criminal Procedure Code enabling the police to arrest individuals to conduct investigations. As we mark our 68th year of independence from foreign powers, I wish to pledge before the people of Sri Lanka that even if my entire family and I myself am imprisoned, I will not deviate from the path of reasserting our national independence, ensuring the territorial integrity of our motherland, restarting the stalled process of economic development and re-establishing our national self respect.